We've seen some spectacular (and adorable) Voltron cosplay, but this crew of mecha fans takes it to the next level. 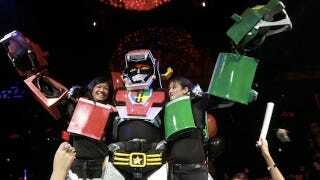 Each member of the group dresses as one of the series' five robot lions, and their costumes assemble to form Voltron. The voltron5 team explains on Instructables how they put their mega costume together, and also has more many photos of the lions and completed Voltron. The whole endeavor took 10 months of planning, purchasing, and research and two months of actual construction. And the results are pretty spectacular—as are the grins on the dressed up lions' faces.